How many times have you participated in CBR? Has it changed the way you read? Not Jen’s cat. But cuuuuuuuute! I did the first six, wrote one review for CBR 8, and then fell incredibly behind. 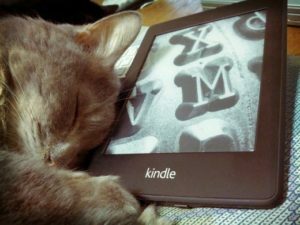 Recently, I have noticed two changes in my reading habits. The first was due to my shift to reading almost exclusively on my iPad/Kindle app. At first, I only used it to read novels didn’t think I wanted/needed physical copies of so I started reading a lot more romance and urban fantasy series. While now I read everything on there, I used to space books in a series a lot more while now I tend to go straight from one to the other because they are so easily available. The other change is that since I wasn’t buying physical books anymore, I wasn’t going into bookstores as often and wasn’t keeping up with what was new at all. Being involved in CBR again has allowed me see what books I have been missing out on and get new ideas for reading material from everyone else’s reviews. How many chapters do you give a book before you move on to (hopefully) better things? Rarely do I actually intentionally give up on a book. I’ve forced my way through some pretty tedious reads. What usually happens is that I decide a book isn’t working for me at the moment and then I “take a break” and somehow never get back to it. I have books that are at the 40% mark that fall into this category but there isn’t a set mark at all. Your blog bio says you’re a world traveler. On a long flight, do you load up a Kindle, listen to audio books on your phone, or stuff a purse/backpack full of paperbacks? Oh, definitely Kindle though half the time I use flights to catch up on movies I meant to see and never got around to – it’s amazing how many choices international flights have now. I only really do audiobooks if I can’t read, so when I am driving or walking or something like that. If I can sit and read, that’s always my preferred method. What’s most important to your enjoyment of a book: Plot? Characters? Writing style? Happy ending? That’s a hard one to answer. I think it’s all about the balance between those things. If you have great characters and a fun style, the plot can be slow. I guess if I really had to choose, characters would probably trump things for me, though. They don’t have to even be likable but they need to engage me. Even if the plot is amazing, if the characters are weak, I will probably get annoyed. I have definitely had a preference for happy endings lately, too. How do you decide what’s next to read on your TBR list? It’s mostly the kind of mood I am in, but if I have read a lot of “light” novels or one genre a lot in a row, I will try to switch it up. If I have read a lot of recently purchased novels, I make myself scroll down and get something from the further back on the TBR pile. 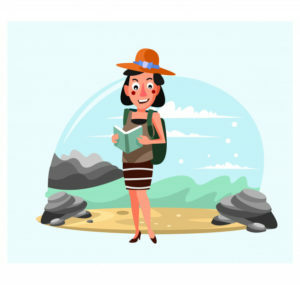 What’s the best book-ish tourist attraction you’ve been to? 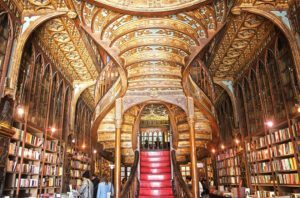 I have visited a few of the famous bookstores like The Strand in NYC and Livraria Lello in Porto, Portugal. My favorite sites are definitely either Poets’ Corner in Westminster Abbey, or the Long Room in Trinity College. I was so excited to see the Book of Kells and I had no idea that leaving that display involved walking through this huge library which would have been worth the cost of entry all on its own. When I was there, they had a fascinating exhibition on the history of medical and dental literature with props used to teach students of those subjects in the past. Livraria Lello. We are all now squirmingly jealous of Jen K.
It’s summer movie season! Do you: A, go opening weekend; B, wait for the crowds to die down; or C, wait until it comes out on HBO or RedBox? If it’s one of the big Marvel ones, definitely opening weekend – I can’t get enough Thor since Thor: Ragnarok and I have always liked the Captain America movies. Other than that, sometimes I just want to go to movies so then it’s a matter of what is actually out worth seeing, and sometimes it happens to be opening weekend. Share the post "Quick Questions with a Cannonballer – Jen K"
I visited the Trinity college library and the Book of Kells when I was sixteen, but I was waaaaay too young to appreciate it! I’d love to go back now and spend lots of time there. It’s kind of funny because I don’t think Dublin would even make my top 10 for favorite cities, but that specific site is definitely one of my favorites to look back, maybe because it was such an unexpected surprise. Thank you, that is so nice of you to say! I’ve said it before, but I’m so glad that you’re back and reviewing books with us again (especially now that I don’t have the time and energy to be competing with you, so I can just enjoy your reviews and not be annoyed that you’re constantly ahead of me). I’m so glad I am back – having the community has really been keeping me sane since I am never home to catch up with friends! I LOVE THE STRAND. I go every time I’m in NYC to visit my friend who works in the children’s department now. I was kinda meh on Dublin so never made it there when I lived in London. I regret it all the time, but now I don’t feel so bad lo. I wanted all the tote bags last time I was at the Strand. Super excited to add to my book tourism next weekend! Yeah, Dublin was already at a disadvantage because I had spent a week in London, a week in the rest of England and a week in Scotland before getting there. Ireland is pretty but if you want impressive castles and not simply once that look nice as part of the landscape, it’s hard to compete with London and surroundings. I’m so glad you’re back, you were one of the first cannonballers (along with Malin, emmalita, narfna…) to make me feel truly welcome my first year or two. I always try my best to comment on new cannonballers’ reviews to hopefully pass that along to someone else. That’s so nice to hear! We had so much overlap in our reading habits, it was easy to comment!